The 6th Biohydromet conference has been brought forward a few months, and will be held in Cape Town in November 2010, back to back with Process Mineralogy ’10. This is to avoid the clashes with the International Biohydrometallurgy Symposium, which is also held biennially, this year in Argentina in September. Although Biohydromet ’10 will be MEI’s 6th conference in the sequence, some of you may remember Biotec ’96, which was held in Falmouth in March 1996, in association with CSMA. This was my first meeting with our Biohydromet consultant, Dr. (now Prof.) Sue Harrison of University of Cape Town. 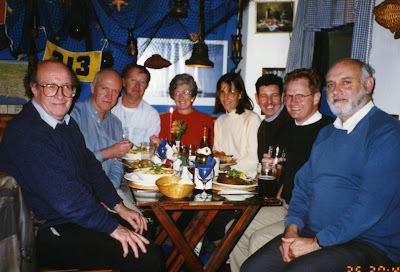 In this photograph, taken at one of Falmouth’s excellent sea-food restaurants are (left to right) Jim Watson (UK), me, John Wells (Chile), Barbara, Sue Harrison (South Africa), Jan Cilliers (UK), Frank Crundwell (South Africa) and Andy Sarosi (UK). Was global cooling caused by leaded fuel? According to a news item in New Scientist (Volume 202 Issue 2707, page 14, April 2009), previous generations unwittingly found a way to cool the Earth, but it’s a polluting approach we are unlikely to want to repeat. Pure water vapour freezes around dust, pollen and even bacteria at higher temperatures than it can as ice alone. This “nucleation” effect allows warmer clouds to form, causing them to radiate more of Earth’s heat into space than cold clouds formed in cleaner air. Dan Cziczo of the Pacific Northwest National laboratory in Richland, Washington, and colleagues, created artificial clouds from aerosol particles collected in Switzerland. They found that while only 8 per cent of these particles contained lead, it was present in 44 per cent of the particles that seeded ice. Cziczo suggests that lead “supercharges” ice- nucleating dust particles. The team calculates that the Earth’s global infrared emission would be 0.8 watts per square metre higher if all atmospheric ice crystals contained lead than if none did (Nature Geoscience, DOl: 1O.1038/ngeo499). By comparison, human-made CO2 has reduced infrared radiation by around 1.5 watts per square metre since pre-industrial times. Before leaded fuel was phased out from road vehicles, the atmosphere contained many more leaded particles than today. This may have helped offset greenhouse warming between 1940 and 1980, says Cziczo. Another example of how complex the equations for climate change are, and how many unknowns are involved in the mechanisms. It was great to read CIM Magazine's recent interview with my old friend Jim Finch. I first met Jim in 1986 at the 2-week NATO conference 'Mineral Processing at a Crossroads' in Falmouth. Since then I have bumped into him at many major conferences around the world, and even played golf with him at St. Andrew's, Scotland! His regular attendances at MEI Conferences are always welcome. Since the NATO conference, Jim has become one of the world's most respected academics, and is always active during the discussion of conference papers. No matter how disappointing a paper might be, he always has words of encouragement and his criticisms are always constructive. I wish there were more Jim Finch's around, and look forward to seeing him in Cape Town in November for Flotation '09. The picture above was taken during the 1986 meeting, when I showed delegates the pilot plant facilities at Camborne School of Mines. 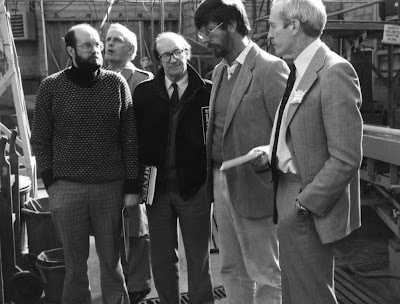 Jim is on the far left, with Derek Ottley, Jim Watson, Wally Kop and me. Terry Mudder of TIME Ltd makes an interesting point in his lead article in the April 2009 issue of International Mining. If global warming is occurring and is the result principally of human activity, then a measurable decrease in carbon dioxide levels should occur based on the recent decline in industrial activity and deep worldwide recession. Under this scenario, the entire planet becomes the laboratory without relying upon controversial climate models. See if you can spot the glaring error in the new flyer for Mineral Processing Technology (apart from the fact that I have not been affiliated to Camborne School of Mines since 1996). Double click to obtain the full-size image. A clue:- the Apostrophe Society (yes, there actually is one) would love this one!! Here's a tip for anyone travelling to Falmouth via London Paddington train station. If you have time to kill, call in at the West Cornwall Pasty Co. shop on Platform 1. Their pasties are excellent, but if you are there at breakfast time you may prefer one of their equally excellent bacon baps, while sitting on the platform watching the commuters dash frantically by. Barbara and I are now back in Falmouth after a long journey back from South Africa. Apart from one lost suitcase, everything went smoothly! The conferences in Cape Town went well, despite the recession affecting numbers. After the conference we watched South Africa thrash Australia in the cricket ODI at Newlands, and Jon and I had a very gruelling, but wonderful, 4-hour walk from Kirstenbosch Gardens to the cable way on the top of Table Mountain. Barbara and I then spent a relaxing week in Mpumalanga, while Jon is still in Africa on an over-land safari in Kenya, Uganda and Rwanda. Good to be back, and I will be catching up on emails over the next couple of days. Barry has asked me to let you know that he is now in the wilds of South Africa (sunning himself no doubt) and has no access to email. He will return on April 18 and will reply to emails then. The turn-out this morning was disappointing, with only 60% of the delegates attending the first session (Environmental), where 5 papers, from South Africa, Spain and Iran were scheduled. We are still trying to ascertain why the three delegates from the Islamic Azad University of Iran did not show, despite 2 of them being authors of one of the papers. After the coffee break, the conference concluded with 4 papers dealing with precious metals and uranium. The draft papers are available on CD-ROM, and authors have been invited to submit final versions of their papers to Minerals Engineering for peer-review. The special Biohydromet '09 issue will be guest edited by Prof. Sue Harrison and Drs. Jochen Petersen and Rob van Hille, from the University of Cape Town. The 5th Biohydromet conference is scheduled for November 2010, at the same venue. We have had a very pleasant evening at one of the Vineyard Hotel's excellent restaurants, with Prof. J-P Franzidis and his wife Rose, and Prof. Sue Harrison and husband John. J-P is one of our consultants for Flotation '09. He commenced lecturing at UCT in 1983, the year after I set up and taught the first course in mineral processing in the Chemical Engineering department. Sue heads the Centre for Bioprocessing Research at UCT and is our consultant for the Biohydromet series of conferences. This was the 4th MEI BioHydromet conference, and, due to the recession, by far our smallest, with 30 delegates representing Brazil, China, Germany, India, Iran, Japan, South Africa and Spain. Initially 56 papers had been accepted for presentation, and withdrawals reduced this to 26, but as I pointed out, it is quality that makes a successful conference and not quantity. Our consultant Prof. Sue Harrison, of University of Cape Town, introduced the meeting, highlighting the potential way forward in biohydrometallurgy. Following this, 7 papers dealing with base metal processing were presented, by authors from South Africa, India, Germany, Japan and Brazil. After a long leisurely lunch break, 4 papers dealing with acid resins, biocorrosion control, preparation of activated carbons from coal, and heap bioleach reactors, were presented in the General session, by authors from South Africa and Iran. During the coffee breaks, 5 posters were presented, representing work in Iran, China, South Africa and Brazil. The degree of interest in a conference can usually be judged by the final day attendance, and this morning we had a full complement, and were also joined by our sole Russian delegate. Later in the morning our 3 delegates from the Islamic Azad University in Iran arrived, after a 24 hour delay at Johannesburg airport!! The only no-show has been an author from the Anhui University, China, who unfortunately had two papers accepted for presentation. This morning's session continued with the theme of sustainability with Sue Harrison of UCT showing how sustainability should be adopted and taught in the mineral engineering curriculum. This was followed by papers from Japan and Brazil. Following the morning coffee break the final session contained eight papers on recycling and waste processing, by authors from The Netherlands, Germany, South Africa, Iran, Brazil and Finland. The 14 posters were also appreciated, providing focal points during the coffee breaks. The poster authors represented Iran, Japan, UK, Korea, Brazil and South Africa. The general impression has been that the conference was of great topical interest, and delegates appreciated its eclectic nature and the opportunity to meet people from widely differing backgrounds. A decision was made to run the event biennially, and SRCR '11 will be held in Falmouth, UK in May 2011. The Proceedings of SRCR '09 are available on CD-ROM, and selected papers will be peer-reviewed for a special issue of Minerals Engineering, which will be guest edited by Profs. Markus Reuter and Kari Heiskanen. 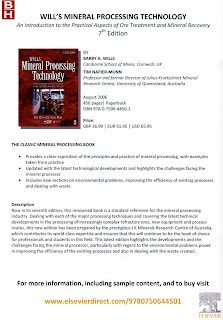 Kari is also the editor of International Journal of Mineral Processing. After an excellent buffet lunch, 5 papers were presented in the afternoon session with the common theme of sustainable processing. Tony Collings of CMSE, Australia, discussed the use of high power ultrasonics to reduce bauxite waste, Alexander Hesketh of University of Cape Town described ways of mitigating the generation of acid mine drainage from copper sulphide tailngs, and Warren Bruckard of CSIRO, Australia, introduced the development of an integrated early removal process for the beneficition of arsenic-bearing copper ores. Two South African papers dealt with mine waters, Godfrey Madzivire of the University of Western Cape on the removal of sulphate from mine water using fly ash, and Lesego Moitsheki of Sasol Technology on the effect of free lime content on high pH and scaling of ash transport water. The session finished with coffee, before the delegates dispersed to sample the delights of Cape Town. The conference commenced on time, and I welcomed our 49 delegates from Australia, Brazil, China, Finland, Germany, Iran, Japan, Korea, The Netherlands, Nigeria, Russia, South Africa and UK. Our consultant Markus Reuter, of Ausmelt, then summarised the need for scientists from disparate disciplines to come together at meetings such as this to discuss the pressing problems of sustainability that affect us all. The first 4 papers were by Australian authors, Prof. Geoff Evans discussing the future demand-supply interaction for the global platinum industry, followed by two papers by Jim Petrie of the University of Sydney on the challenges and needs for mineral carbonisation for energy intensive minerals conversion. Finally, before the coffee break, Stevan Green of the Cooperative Research Centre for Sustainable Resource Processing discussed the incorporation of sustainable development into minerals processing design and operation. This is the beautiful view of Table Mountain and Devil's Peak which greets conference delegates. To obtain high resolution images of any photos on the blog, double click the image and then download. A very hot day today in Cape Town, but very pleasant at 4.30pm for pre-registration and the welcoming wine reception, attended by roughly a third of the registered delegates. We arrived in Cape Town yesterday-23 hours door-to-door. This morning Jon and I met with the Vineyard Hotel staff and then had an easy 15 minute walk to Newlands Cricket Ground, where we bought tickets for next week's ODI between South Africa and Australia. Good to hear today that the Ian Wark Research Institute has agreed to sponsor the General Minerals Engineering section of MEI Online. Many of the big companies have imposed a freeze on 'non-essential' expenditure, including sponsorship. As a consequence, some of the MEI Online sections are now becoming available for exclusive sponsorship, which gives smaller comanies the opportunity to highligh their continuing existence, and also take advantage of the very weak pound. Could the recession increase global warming? One of the important conclusions in the paper cited in the March 28th entry is that if man-made CO2 is a major contributor to climate change, then the current recession should slow down global warming, due to the shutdown of many major CO2 producers, such as steel-making plants and smelters. However an article in The Times (March 23rd) poses a possible counter to this. The recession is changing eating habits, with people now staying more at home to eat rather than at expensive restaurants. According to the Metal Packaging Manufacturers’ Association, tin can output in the final quarter of last year increased by 10% and the Anglo-Dutch steelmaker Corus has raised the price of tinplate because of an increase in demand of up to 50%. The market research group TNS reports that baked beans and tinned puddings are the stars of the canned food market, the volume of baked beans sold showing a recent rise of over 2%. An increase of 2% is high, because of the sheer volume consumed, and some scientists are predicting that the associated increase in greenhouse gases could lead to a much more rapid melting of the polar ice-caps than previously predicted.